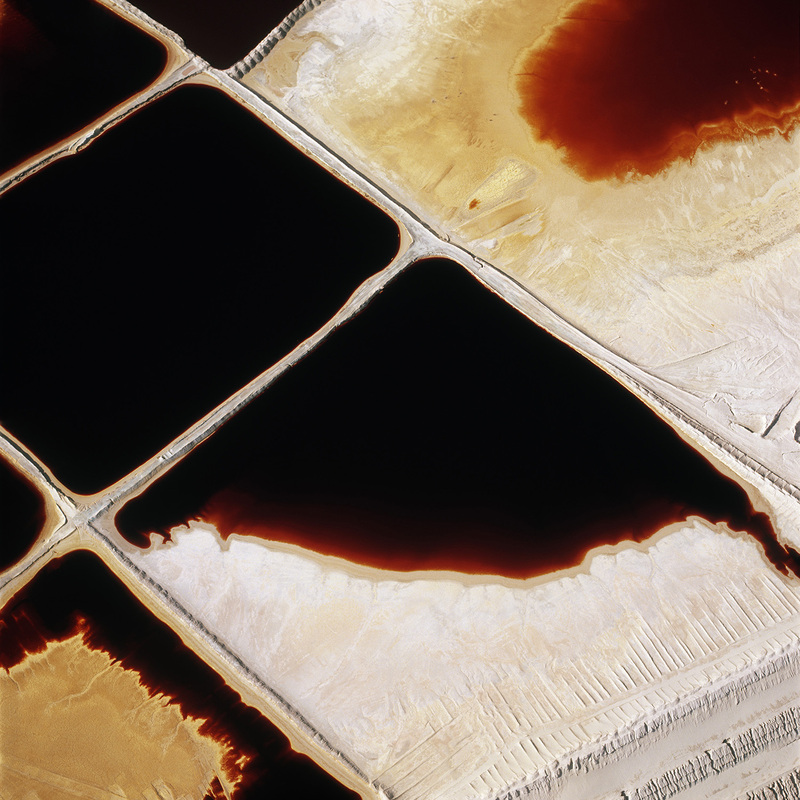 David Maisel’s photographs of cyanide-leaching fields, tailing ponds, vast open pits—the results of a mining industry in the western United States that has permanently scarred and reshaped countless terrains—are simultaneously seductive, beautiful, repulsive, and terrifying. Strikingly vivid colors luminescing from the earth’s surface in unconventional compositions combine to make immediately captivating pictures. The ambiguity of what is depicted, and the apparent toxicity suggested by the saturated colors pervading these colossal human-made sites, however, leave one with an overall sense of alarm. This effective duality of attraction and abhorrence characterizes Maisel’s earlier work, too, but it intensifies with The Mining Project. In this work the artist negotiated a very considered shift from black-and-white film to color and started to produce large-scale photographs that make greater use of abstraction. Maisel’s 1989 photograph The Mining Project (Butte, Montana 6) (page 80), for example, appears like a Romantic landscape, with a horizon line and billowing purple storm clouds closing in on the break of sunlight—not unlike a mid-nineteenth-century Hudson River School painting depicting an awe-inspiring scene of uninhabited American wilderness. However, in this case, Maisel’s photograph is a bird’s-eye view of the base of an abandoned mine in Butte, Montana, where the purple-looking clouds are, in fact, a pool of thirty billion gallons of toxic water, polluted with heavy metals like copper, zinc, and iron. Scientists believe the site is so toxic that it can never be reclaimed.8 There are no visual clues that give away the scale of the pool and surrounding terrain, which makes the work abstract in a way Mark Rothko may have appreciated. The strong element of the technological sublime that runs through Maisel’s work reflects a perverse awe, reorienting the common association of nature with the sublime to something supremely human, our ability to engineer nature.11 We are astonished by human-made objects whose immensity and magnificence appear to rival that of the natural world.12 Maisel’s photographs of open-pit mines from thousands of feet above the earth go further, however: while viewers might be astounded by the human ability to master the environment, awe turns to anxiety upon realization of the large-scale degradation involved. Visual communications professor Jennifer Peeples aptly defines this elicited response as the toxic sublime: “The toxic sublime acts to counter that marvel with alarm for the immensity of destruction witnessed. Furthermore, in contrast to the sublime in nature, which functions to improve moral character, the horror of the toxic sublime calls to question the personal, social and environmental ethics that allows these places of contamination to exist.”13 For Maisel, the artistic potential of these places is directly correlated with their noxious reality: “The baser the site, the more susceptible it seems to be for poetic contemplation, the more fascinating it becomes as subject matter.”14 Maisel’s photographs show the sublime effects of these great engineering feats layered on a landscape with its own history of the sublime. The color illuminated from the earth’s surface represents the toxicity of human intervention, but the seduction of the color remains. This notion of beauty recalls a comment Walker Evans made during an interview in 1974: “A garbage can, occasionally, to me at least, can be beautiful. That’s because you’re seeing. Some people are able to see that—see it and feel it. I lean towards the enchantment, the visual power, of the aesthetically rejected subject.”18 Maisel is similarly attracted to the “aesthetically rejected” subject. Accepting multiple versions of beauty, Maisel’s pictures seduce the viewer with his aesthetic response to the mining sites. Ultimately his photographs reflect upon the civilization that contains these rejected subjects. Land artists of the late 1960s and 1970s—such as Michael Heizer, Nancy Holt, Richard Long, Robert Morris, and Robert Smithson—were concerned with the intricate relationship between landscape and art, and with the human ability to construct landscape, and they should also be regarded as influential on Maisel’s ideas and strategies when he conceived of The Mining Project. Robert Morris believed immense open-pit and strip mines, as well as quarries and deep-shaft mines, would permanently reshape the land they occupied and would ultimately qualify as significant monuments of the twentieth century. “All great monuments celebrate the leading faith of the age—or, in retrospect, the prevailing idiocy,”19 he noted wryly in 1979. He also thought a great deal about the toxic aspects of his Cibachrome materials and the environmental impacts of the entire medium of photography. Returning in 1985 from his first major excursion photographing copper and gold mines from the air, he developed the film and then stopped to reflect on his process. “In using photography, let alone aerial photography, wasn’t I as guilty as anyone else in contributing to environmental degradation?”24 One can look at Maisel’s entire Black Maps oeuvre, in fact, as a metaphor for the natural resources exploited in the production of photography: logging to produce paper; mining to produce minerals for film, paper, and processing; and water to enable the chemical reactions of the traditional photographic medium.25 Maisel accepts his personal involvement and that of the medium, recognizing that as a society we are all implicated in extracting from the earth what we need or want with little regard for the consequences. Not merely critical of the mining industry, his work stands as a critique of photography, which reflects the desires of the society that produces it. Maisel’s photographs carry within them our varied notions of beauty, with a diverse sensibility for grandeur drawn from both our surroundings and our selves. Photographs from The Mining Project contain both oppositional and complementary notions of the sublime, and thus remove Maisel from the more easily defined categories of the socially active, environmental, or technologically oriented artist. For Maisel, aesthetics are in no way opposed to the forces that might compromise them. The visually complicated can be culled from all manner of sources—the human, the technological, the natural, and the evolving. Maisel’s pictures seduce and unsettle us. We see beauty in toxicity and witness the sublime in the seditious treatment of nature. In this experience of the sublime, anxiety supplants rectitude. Consequences of our fascination exist, of course, but they cast neither guilt nor absolution. 1 David Maisel, email correspondence with the author, November 7, 2011. 4 Edmund Burke, On the Sublime and Beautiful, vol. 24, part 2, The Harvard Classics (New York: P. F. Collier & Son, 1909–14); Bartleby.com, 2001. www.bartleby.com/24/2/. 5 Natalie Kosoi, “Nothingness Made Visible: The Case of Rothko’s Paintings,” Art Journal 64, no. 2 (summer 2005): 20–31. 6 David E. Nye, American Technological Sublime (Cambridge, MA: MIT Press, 1994), xiv. 7 Edmund Burke, On the Sublime and Beautiful, vol. 24, part 2, The Harvard Classics (New York: P.F. Collier & Son, 1909–14); Bartleby.com, 2001. www.bartleby.com/24/2/. 8 Alan Berger, Reclaiming the American West (New York: Princeton Architectural Press, 2002), p. 89. 9 Kosoi, “Nothingness Made Visible,” 20–31. 11 Nye, American Technological Sublime, xiv. 12 Jennifer Peeples, “Toxic Sublime: Imaging Contaminated Landscapes,” Environmental Communication 5, no. 4 (December 2011): 373–92. 14 Excerpted from David Maisel’s lecture for the Penny W. Stamps Distinguished Speaker Series at the University of Michigan, Ann Arbor, February 10, 2011. 15 David Maisel, email correspondence with the author, November 7, 2011. 17 Maisel, University of Michigan lecture, February 10, 2011. 18 Walker Evans interviewed in “Walker Evans—The Thing Itself Is Such a Secret and so Unapproachable,” George Eastman House, Image 1, no. 4 (December 1974). Originally published in Yale Alumni Magazine, February 1974. 19 Robert Morris, keynote address on July 31, 1979, for the symposium “Earthworks: Land Reclamation as Sculpture,” sponsored by the King County (Washington) Arts Commission. Printed in Robert Morris, “Notes on Art as/and Land Reclamation,” October 12 (spring 1980): 87–102, 102. 20 Maisel, email correspondence with the author, November 7, 2011. 21 Thomas Dreher, “Robert Smithson: Land Reclamation and the Sublime,” Arte Factum 45 (October/November 1992): 26. 22 Maisel, University of Michigan lecture, February 10, 2011. 23 Maisel, email correspondence with the author, November 7, 2011.